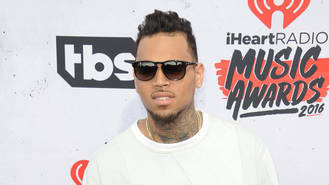 An overzealous Chris Brown fan has been arrested for trespassing on his California property for the second time in five months. The R&B singer was at home in the early hours of Thursday (28Apr16), when his security guards spotted Danielle Patti outside his Woodland Hills pad. Sources tell TMZ.com Patti had waited at the front gate until it was opened for another visitor, and then allegedly made her move to creep onto the grounds. She was found by security officials, who detained her until police arrived on the scene to investigate. She was subsequently arrested on two counts of trespassing. Patti appeared in court on Friday (29Apr16) to face the charges, to which she pleaded not guilty. Brown is now planning to file for a temporary restraining order against the woman, who pulled a similar stunt in December (15). During last year's incident, Patti, 27, was alleged to have driven her car onto Brown's property and then refused to leave. She was taken into custody on suspicion of criminal trespass. The obsessed devotee, who claimed to be dating the Kiss Kiss hitmaker, accused him of purposefully having her arrested, before trying to obtain a protective order against Brown amid allegations he had threatened her on social media. She was granted the temporary order in early March (16), but an attempt to make it permanent was rejected by a Los Angeles judge weeks later after she failed to present evidence of the threatening messages she had received from Brown. Brown is no stranger to fan harassment - in May, 2015, he returned from a trip to Las Vegas to find a female intruder lying naked in bed in his Agoura Hills home. Amira Ayeb, an aspiring singer from Tunisia, was arrested and charged with felony stalking, vandalism and burglary. She denied the counts and was hit with a protective order banning her from contacting Brown for three years. Nick Carter has shared the first photo of his son, Odin Reign. Blonde want to work with Zayn Malik. Rihanna and Leonardo DiCaprio are apparently not far off being “exclusive”. Zayn Malik and Perrie Edwards are set for a reunion at this year's Capital FM Summertime Ball. French Montana is moving in to Selena Gomez's old home after purchasing the Calabasas, California mansion at a discount. David Hasselhoff once belted out a tune with late opera legend Luciano Pavarotti. Adam Levine's pregnant wife Behati Prinsloo has constant cravings for watermelon. Midge Ure has hit out at musicians who use other writers. Fans will be able pay tribute to late icon Prince during a public memorial in Los Angeles next month (May16).